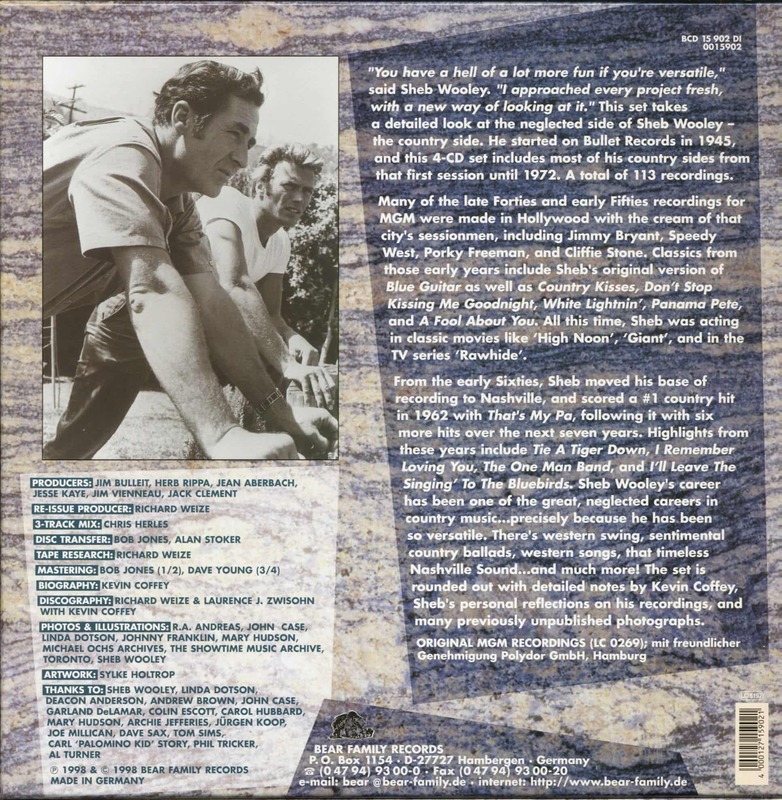 4-CD box (LP-size) with 44-page book, 113 tracks. Playing time approx. 292 mns. Sheb Wooley has done it all: singer, songwriter, comedian and actor. 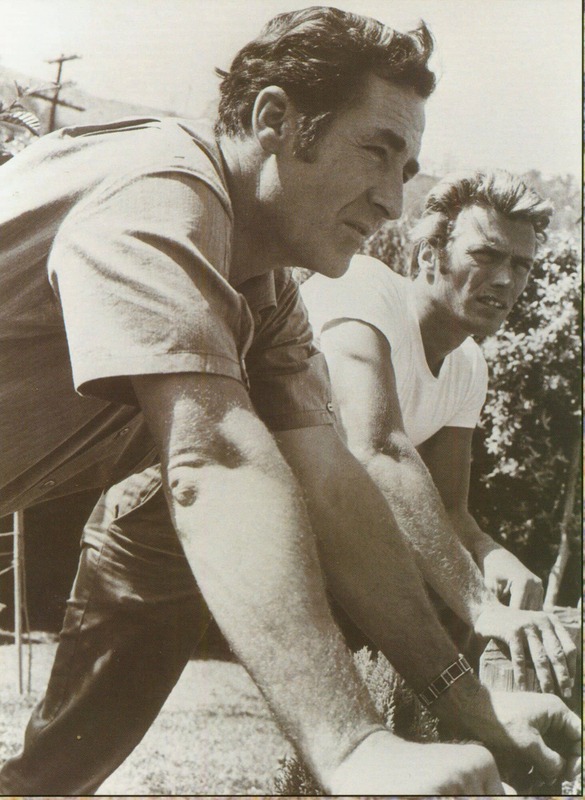 In a career that spans over a half century he has scored major hits as performer and songwriter, like Purple People Eater and That's My Pa, and acted in such important films as 'High Noon' and 'Giant'. This set contains most of his Country recordings. 4 CDs, over 110 tracks, including many sides never before issued and many never reissued on LP or CD trace the singer-songwriter-actor-comedian's multi-faceted career from his first sides for Bullet in 1945, followed by his short but important stop at Dallas' Bluebonnet label, to his long stint at MGM that began in 1948 and continued into the 1970s. Zeb Turner, Grady Martin and Harold Bradley in Nashville, not to mention Wooley's own Calumet Indians in Texas. 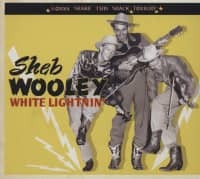 Included here are hits like Wooley's first, Peepin Through The Keyho’nd subsequent charters like That's My Pa, Blue Guitar, Tie A Tiger Down and many others. 'You have a hell of a lot more fun if you're versatile, said Sheb Wooley. I approached every project fresh, with a new way of looking at it. 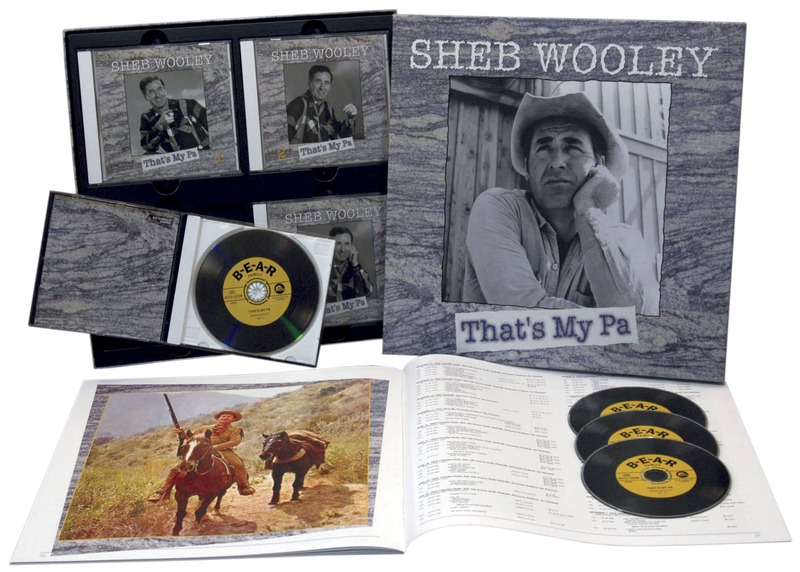 This set takes a detailed look at the neglected side of Sheb Wooley -the country side. He started on Bullet Records in 1945, and this 4-CD set includes most of his country sides from that first session until 1972. A total of 113 recordings. Many of the late Forties and early Fifties recordings for MGM were made in Hollywood with the cream of that city's sessionmen, including Jimmy Bryant, Speedy West, Porky Freeman, and Cliffie Stone. 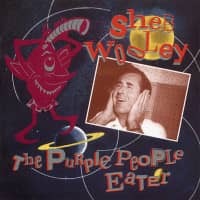 Classics from those early years include Sheb's original version of Blue Guitar as well as Country Kisses, Don't Stop Kissing Me Goodnight, White Lightnin', Panama Pete, and A Fool About You. 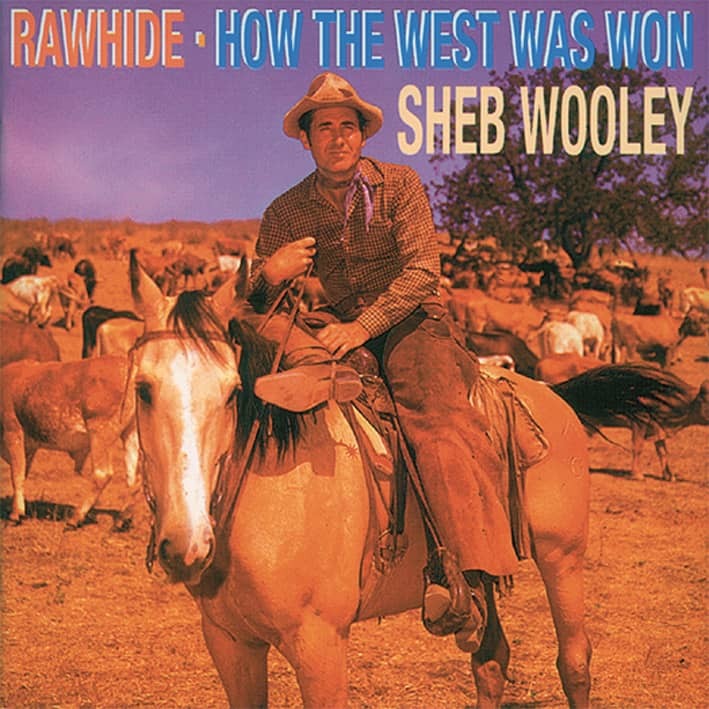 All this time, Sheb was acting in classic movies like 'High Noon', 'Giant', and in the TV series 'Rawhide'. 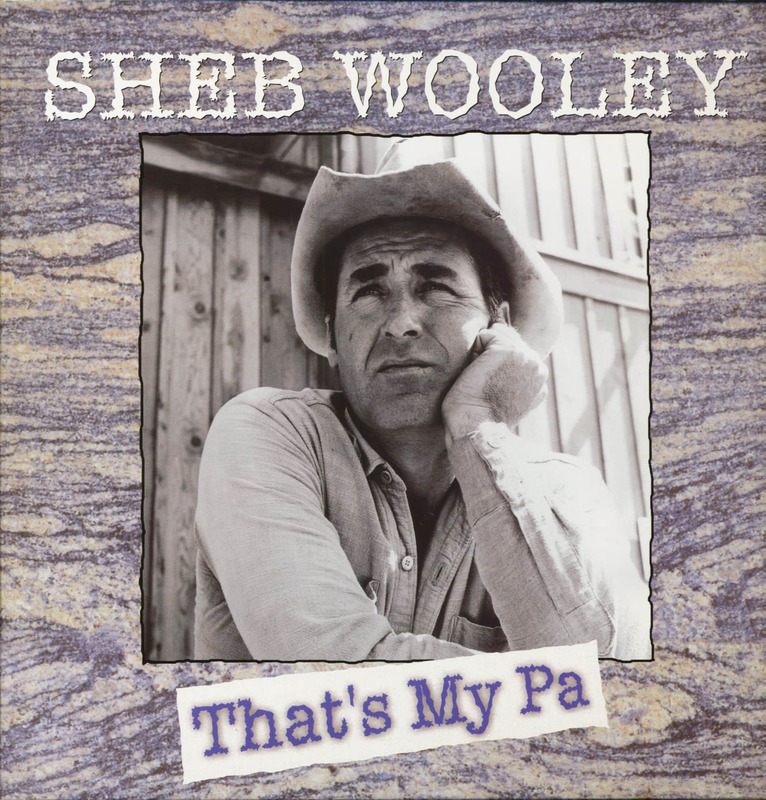 From the early Sixties, Sheb moved his base of recording to Nashville, and scored a #1 country hit in 1962 with That's My Pa, following it with six more hits over the next seven years. Highlights from these years include Tie A Tiger Down, I Remember Loving You, The One Man Band, and I'll Leave The Singing' To The Bluebirds. 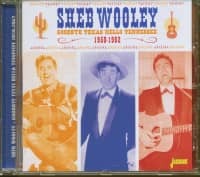 Sheb Wooley's career has been one of the great, neglected careers in country music...precisely because he has been so versatile. There's western swing, sentimental country ballads, western songs, that timeless S Nashville Sound...and much more! The set is rounded out with detailed notes by Kevin Coffey; • Sheb's personal reflections on his recordings, and many previously unpublished photographs. Customer evaluation for "That's My Pa (4-CD)"